I had the a stuffed cheese slice ($4.99+tax) and a regular soda (1.99+tax). 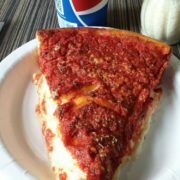 The pizza was really good – it tastes very similar to Gino’s East. The crust was delicious – it has a slightly buttery flavor that makes it taste really good. They offer three types of slices – thin ($3.99 + tax), pan ($4.49), and stuffed ($4.99). I was not sure which one to order, so the manager was nice and explained that the stuffed is the pan slice but with an extra layer of cheese and dough. He said they are known for their stuffed pizza, so that influenced me to get the stuffed. I suspect he is tired of explaining that, but he definitely did not show it. I also had a fountain drink, which includes free refills. They keep the slices warmed at 175 degrees F, so they are ready as soon as you order. They seem to specialize in slices, though you can order whole pies and sandwiches. The staff is also very nice and accommodating, and they keep the place very clean. Note that the entire dining area is somewhat small, though they had enough seats on a Saturday at lunch time. I originally tried to go to Lou Malnati’s down the street, but they had a 45 minute wait, so I went to Art of Pizza, and glad that I did since it is cheaper than Lou’s and you don’t have to wait since the slices are ready when you order, and you don’t tip like you do at Lou’s since you order at the counter at Art of Pizza. In comparison to the other Chicago style pizzas, I put Art of PIzza on par with Giordono’s, Gino’s East, and Pizzeria Uno, but not as good as Lou Malnati’s. Lou’s is my favorite, but as noted earlier, Lou’s had a wait and is more expensive. Also, unlike the others, you don’t have to wait or tip at Art of Pizza. I also prefer Art of Pizza over Pauly’s, which is located next door, but Pauly’s is still worth visiting. I will definitely return and suggest that you try Art of Pizza.